Riding, Pedaling, Everyday Cycling, What do you call it? Awhile back, Tori over at Gracie’s Wrench asked for suggestions for a new term to describe cycling as transportation or everyday cycling. “Commuting” usually refers to going to and from work. “Riding” usually refers to sport riding. What do you call everyday cycling? I read all the comments to her post, and quite frankly, none of the terms really spoke to me. Not in the same way “commuting” does. I’m looking for a good one (maybe two) word term to describe using a bike to go to the store or to get coffee or out to dinner. This entry was posted in alternative transportation, bikes, Everyday Biking, shopping and tagged cycling, everyday biking, everyday cycling, words. Bookmark the permalink. I think everyday cycling is simple activity so we should use simple words. As for me, cycling and everyday cycling sound good. But English is not my native language so these words could have different meaning for me. 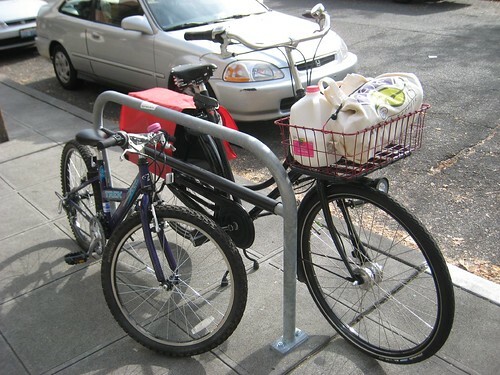 “Utility Cycling” is the term I see most widely used. “Transportational Cycling” is descriptive, though a bit wordy. Also, technically, “transportational” is not a word. Interesting thought: It’s so normal now I just call it cycling, or going shopping, or taking the boys out, or getting the recycling done. Hmm… The German word is ‘Radfahren’ which can be translated ‘Bike Driving’. A bit clumbersome though. I like Radfahren….bike driving is the perfect description. I just tell people I’m riding or commuting to work. In SF I don’t get any questionable looks. It’s just normal. Only agressive cagers give the look of me on my bike getting in their way. Even if it is at a stop light or a few seconds when I change lanes to the left for a left turn. I know we shouldn’t need special words but for some reason defining riding everywhere as “utility cycling” or “urban cycling” or “city cycling” helps people wrap their heads around our choice to bike everywhere. When asked, “are you going for a ride”, I often reply, ‘no, just riding to (fill in the blank)”. We pretty much talk about cycling, and ourselves as cyclists, though that’s probably due in part to my husband spending so much time in racing- and recreation-oriented shops way back when. This is a good question. It would be great to have a term to define this. This is one of those things I found difficult to describe when I was going out shopping for a bike. For example, I wanted a bike I could transport my son on, a bike I could grocery shop and ride errands on, a bike I could use for a leisurely ride, a bike I could use to go out and meet up with some friends, a bike that didn’t make me have to stop and think “do I need to change my clothes first”, and a bike I could wear just about anything on. What would define this? basically this is how I use(d) my car but wanted to use a bike instead. Good question, I am enjoying hearing what people have to say and look forward to more comments. I generally use “transportation cycling.” This effectively separates it from sport cycling or riding trails or such. My 2c. Lifestyle. That’s the word that came to mind when I read the Gracies Wench post. This is also the comment I most often use when I shopped for my bike and explaining to my friends my bike choice. It was funny how “commuting” was the comment most mentioned to me and I had to say “no” what I want to do is so much more; it’s my lifestyle. It may not be a word to use in place of “commuting” but it is what comes to mind when I read blogs like this and when I hop on my own bike. “Commuting” doesn’t work for me either … I do bike commute, but my most enjoyable rides are just getting places I want to go with my kids. Or making excuses to go someplace on the bike. And did you see this article on “child miles” growing much faster than commute miles in terms of car use? It’s those kid-schlepping trips that I’d love to see replaced by bike, so ideally this word would evoke family cycling as well. Utility cycling doesn’t capture the fun of it. Everyday cycling works nicely for me. And I really like the xtracycle slogans – “every day adventure” and “practical meets magical” but they’re a mouthful. Thanks for the link. 3956 family miles a year? I wonder how many trips those miles comprise? Most likely in the range of 2000-3956 trips. Judging from the parking situation at the local pool (which is less than a mile from our house) most people just can’t be bothered to use their feet or their legs unless they’re pushing down on a gas pedal. Me, I ususally just call it “going somewhere” or maybe “riding”. Pretty much everyone who knows me just interpolates the bike without any prompting. We just need to train all the people who don’t know me. I’d have to go with “utility cycling” or just “biking” depending on what I’m doing – replacing car trips (shopping, laundry runs) are utility rides, popping over to a buddy’s house on my bike to drag him and/or his wife out for a ride is biking. Good discussioin, folks. Anne already outed my “bike life” — as in “livin’ the bike life. I also think plain old riding sums up what we do pretty well. Though I have to admit I really like Radfahren — other than the fact that it sounds a bit like a metal band, I think it’s sounds pretty cool (assuming it sounds like I think it does: rod-far-en). No suggestions, but your post did make me chuckle at the idea that I would probably reply with “running errands”, which usually means a car, and has nothing to do with running! I call it life since it is such an integral part of our life. I love reading all these comments. Gotta say that I think I will be adopting ‘radfarhen’ in my vocab. I do bike commute to work and try to “bike it” or “pedal” to the farmer’s market, art fairs, and short trips to the grocery store. Like many of the other people who posted comments, I’ve tried to make choosing my bicycle to get to where I want to go just a normal option for me. how about ‘People on Bikes’. ‘Radfahren’ is ‘Rad-faaar-en, so Tim, you were pretty close. I’m glad people like it. I thought of this post today when I met two friends commuting home, one by bus, one by car. Both were tired and stressed, I’d wound down in the fresh air and exercise. Unfortunately ‘stress free low cost non-polluting healthy transportation and recuperation’ is a bit too long: It’s even longer in German. After this morning’s ride in to work, I found that I don’t need a term for my biking into work. As long as drivers know that I’m just doing what they’re doning, trying to get work and spend 1/3 of my day staring at a computer screen, and they respect my rights to the road as they would respect other drivers then I’m happy. BTW, I had a good ride in today. Drivers gave the right of way. Even the left turns and lane changes were easy. Either they know me enough or they’re getting the idea the cycling is here to stay. Super great to hear. All the data shows that the more of us there are, the safer it gets for all of us. Sounds like your commute “partners” are reaching that point of understanding!